S&S Cycle has appointed Justin Bramstedt to the position of Racing Manager to oversee the design and sale of S&S Racing Products as well as to manage the entire racing program. Justin is a 1998 graduate of Mankato State University in Mankato MN, with a degree in Automotive Engineering Technology. He also attended a two year course at the Motorcycle Mechanic’s institute. That’s a useful background to have when you’re designing high performance v-twin engine parts, but just as important are some of his other experiences. Justin is a long time rider and drag racer, and he’s always gravitated toward Harley-Davidson® motorcycles. In addition, during college, he worked full-time as an ASE certified automotive technician. Even now, he runs a full service motorcycle and machine shop as a side business. 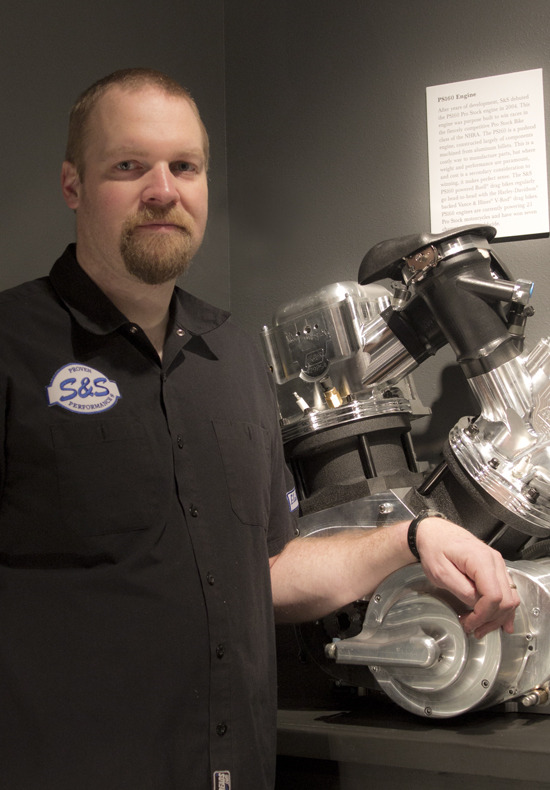 Justin’s combination of technical expertise and first hand knowledge of the ins and outs of the v-twin market made it a natural fit that he would come to work at S&S Cycle in 1999. By 2007 he was promoted to Manger of the Research and Innovation Department. In that position he oversaw the development of a large number of important S&S products including the S&S 4-1/8” bore engine, S&S clutch, S&S helical gear transmission, B2 cylinder heads, exhaust systems, and many others.